Weather fine. Our second one in the U.S. service. some of the boys received boxes from home containing good things which they divided with others. Connecticut mince pies were all right. We had baked chicken prepared by a baker in town. Our Thanksgiving in camp passed very quiet and pleasant. Excused from all duty except picket and guard. These days are passing quietly, nothing extra so far to perform. Kept busy most of the time. 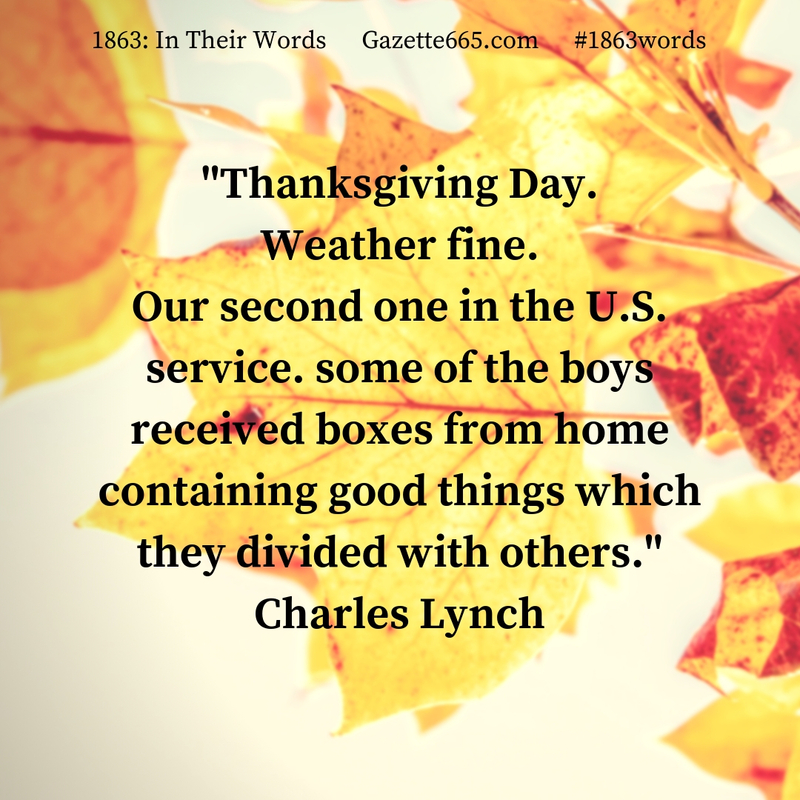 Excerpt from Charles Lynch’s journal; November 28, 1863. This regiment formed in August 1862 and its soldiers faced their second winter away from their homes. Already the regiment had been in Baltimore, Maryland, on fort duties until May 1863 when they joined Robert Milroy’s army in the Shenandoah Valley. They fought at the second Battle of Winchester and many soldiers were captured and paroled by the advancing Confederates who were headed north into Pennsylvania. 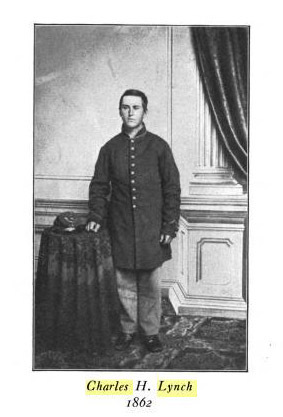 By October 1863, most of the regiment’s survivors had reunited, paroled or exchanged and returning to the unit members who had not been captured. The 18th Connecticut would winter in Martinsburg, West Virginia, and Hagerstown, Maryland. During 1864, the regiment would operate with various commanders in the Shenandoah Valley region, including Sigel’s operations which ended at the Battle of New Market. (New Market has been my recent research/writing project – more on that next year!) In June 1865, the Connecticut volunteers would muster out and return to their homestate. Thanksgiving jumps around on the calendar, but it was traditionally more random during the early and mid-19th Century. Typically, a community or state would declare a thanksgiving holiday that had both religious and cultural connotations, and they didn’t all declare on the same day! In 1863, President Lincoln had issued his Thanksgiving Proclamation, setting aside one day of Thanksgiving for Union supporters. Thus, many soldiers had one day of celebration. Charles Lynch particularly noted that some of his comrades got boxes from home with holiday goodies. Likely, these were packed and shipped by family members or friends, but they could have come from a community or relief society, too. Lynch does not specify since he was more excited about the boxes’ contents and the other foods. Apparently, mince pies were a real treat and had survived the shipping. “Boxes from home” have often been an important part of American homefront support for the military, especially around the holidays. Whether its food, greeting cards, or special gifts, it’s always been a wonderful way to let service members know they are remembered and appreciated. Charles Lynch gives us a glimpse into that importance of being remembered from a Civil War soldier’s perspective. 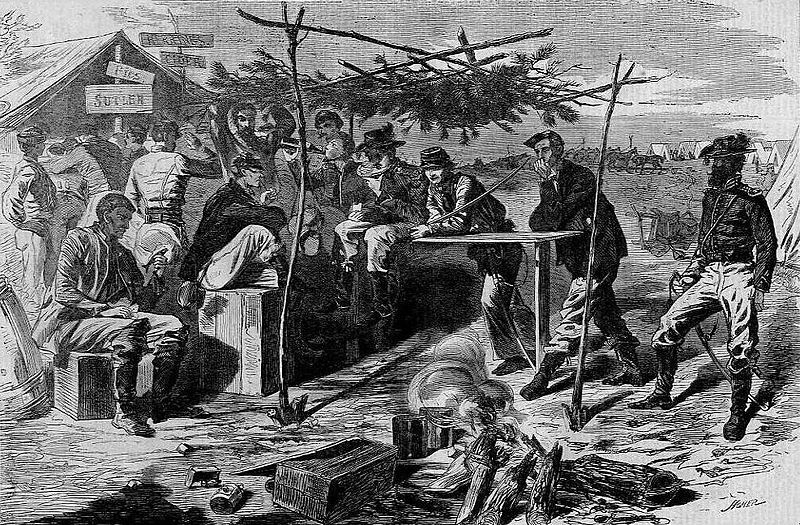 A woodcut depicting soldiers celebrating Thanksgiving during the Civil War. Charles Lynch kept a journal of his war experiences – not always detailed accounts and not particularly eloquent. Still, his writing offers insight into his experiences and his regiment’s campaigns. I found Lynch’s journal (which has been reprinted) while studying soldiers who fought at the Battle of New Market, and he became one of my favorite Union soldiers from that campaign. His details from the spring of 1864 and particularly “boots on the ground” and “this is the way it is” in perspective. Lynch frequently notes in the inglorious realities of war and describes the hardships and deprivations endured by the common soldier. Sometimes Lynch’s journal seems very personal, almost like he is writing to himself. After describing numerous difficulties, he seems to pull together some cheerfulness and write reminders to himself that it is a soldier’s duty, he must not complain, and he must expect hardships. It’s these details, these glimpses of a real person and his character from over a century and a half ago that keep me reading primary sources and trying to better understand the struggles, success, and desires of the past. Often, we find they were not much different that our own wishes – just in a different time and place. I hope you had a marvelous Thanksgiving this year with many “good things” to “divide with the others.” If you’re ready to get a headstart on your holiday shopping, I’ll just mention that Gazette665 is having a CyberWeek sale on books and music. Previous Elizabeth Hopkins: Cooking History?